Click on graph to view full size version. 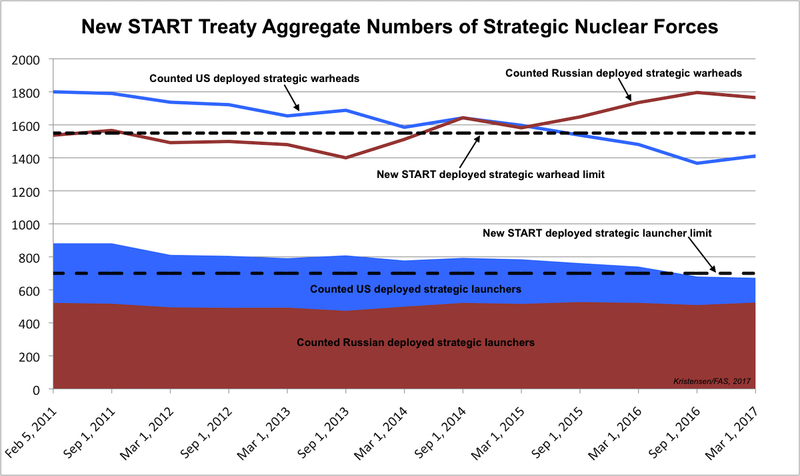 The latest set of New START aggregate data released by the US State Department shows that Russia is decreasing its number of deployed strategic warheads while the United States is increasing the number of warheads it deploys on its strategic forces. The Russian reduction, which was counted as of March 1, 2017, is a welcoming development following its near-continuous increase of deployed strategic warheads compared with 2013. Bus as I previously concluded, the increase was a fluctuation caused by introduction of new launchers, particularly the Borei-class SSBN. The US increase, similarly, does not represent a buildup – a mischaracterization used by some to describe the earlier Russian increase – but a fluctuation caused by the force loading on the Ohio-class SSBNs. The data shows that Russia as of March 1, 2017 deployed 1,765 strategic warheads, down by 31 warheads compared with October 2016. That means Russia is counted as deploying 228 strategic warheads more than when New START went into force in February 2011. It will have to offload an additional 215 warheads before February 2018 to meet the treaty limit. That will not be a problem. The number of Russian warheads counted by the New START treaty is only a small portion of its total inventory of warheads. We estimate that Russia has a military stockpile of 4,300 warheads with more retired warheads in reserve for a total inventory of 7,000 warheads. The United States was counted as deploying 1,411 strategic warheads as of March 1, 2017, an increase of 44 warheads compared with the 1,367 strategic deployed warheads counted in October 2016. The United States is currently below the treaty limit and can add another 139 warheads before the treaty enters into effect in February 2018. The number of US warheads counted by the New START treaty is only a small portion of its total inventory of warheads. We estimate that the United States has a military stockpile of 4,000 warheads with more retired warheads in reserve for a total inventory of 6,800 warheads. The New START data shows that Russia as of March 1, 2017 deployed 523 strategic launchers, an increase of 15 launchers compared with October 2016. That means Russia has two (2) more launched deployed today than when New START entered into force in February 2011. Russia could hypothetically increase its force structure by another 177 launchers over the next ten months and still be in compliance with New START. But its current nuclear modernization program is not capable of doing so. Under the treaty, Russia is allowed to have a total of 800 deployed and non-deployed strategic launchers. The data shows that it currently has 816, only 16 above the treaty limit. That means Russia overall has scrapped 49 total launchers (deployed and non-deployed) since New START was signed in February 2011. The United States is counted as deploying 673 strategic launchers as of March 1, 2017, a decrease of eight (8) launchers compared with October 2016. That means the United States has reduced its force structure by 209 deployed strategic launchers since February 2011. The US reduction has been achieved by stripping essentially all excess bombers of nuclear equipment, reducing the ICBM force to roughly 400, and making significant progress on reducing the number of launch tubes on each SSBN from 24 to 20. The United States is below the limit for strategic launchers and could hypothetically add another 27 launchers, a capability it currently has. Overall, the United States has scrapped 304 total launchers (deployed and non-deployed) since the treaty entered into force in February 2011, most of which were so-called phantom launchers that were retired but still contained equipment that made them accountable under the treaty. The United States currently is counted as having 820 deployed and non-deployed strategic launchers. It will need to destroy another 20 to be in compliance with New START by February 2018. Both Russia and the United States are on track to meet the limits of the New START treaty by February 2018. The latest aggregate data shows that Russia is again reducing its deployed strategic warheads and both countries are already below the treaty’s limit for deployed strategic launchers. In reality, the United States has not fallen behind but has 150 strategic launchers more than Russia. The New START treaty is not a “bad deal” but an essential tool to provide transparency of strategic nuclear forces and keeping a lid on the size of the arsenals. Russia and the United States should move forward without hesitation to extend the treaty by another five years. As for France and PRC what your estimate ? As for DF-41 could it carry 2 2-300 KT warheads,because chinese tested only 45 times ? As for the DF-41, DOD has reported it will be capable of MIRV but it is not yet deployed and we don’t have much info about possible warheads. Assumption I hear most is warhead is probably same type used on DF-31/31A. As for MIRV numbers, I am skeptical about reports of 10 MIRV per missile. Objective of Chinese MRV/MIRV is not counterforce surprise attack but securing retaliatory capability against missile defenses. So I think DF-5B and DF-41 are more likely to be equipped to carry ~3 MIRV. Mr. Kristensen – New Start may be nothing more than paper fiction unless both countries are totally transparent to inspections to verify compliance. Is this the case, or is compliance based on the Boy Scouts honor system? Based on their historic behavior and the state of current U.S.-Russia relations, my guess is the Russians haven’t really dismantled or destroyed anything – it’s still in storage if needed. To think otherwise is to be naive Their long term goal has ALWAYS been to maintain the upper hand, even if only by a small margin. Someone prove me wrong, please! In order to justify and excuse our, what will be, unilateral disarmament, the myth of equality has to be propagated with the only real data being the US Arsenal which has very close to that number. Remember the Soviet Union had 45,000 nuclear warheads by the end of the Cold War. And the Russians have cheated on EVERY arms control treaty they ever have signed.